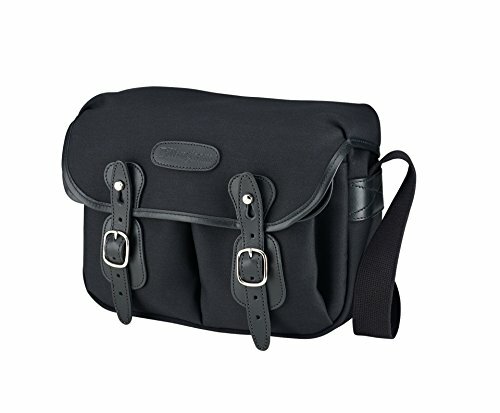 Based on the ever popular Hadley original, The Hadley Pro is a mirror with added features. A carrying handle is integrated with a stiffener into the top flap. The weight of your gear is not carried through canvas holes that could wear out, rather they are attached to a fiberglass stiffener and weight supported through that. A waterproof zippered back pocket is very useful for tickets, magazines, manual or any other flat document. The facility to add extra capacity with the area pouches rounds off the bag nicely. It has a fully removable insert and features adjustable quick release strap into brass buckles, bellowed front pockets with press-stud fastenings and a double darted main flap which covers the mouth of the bag when closed protecting it from rain and weather elements. The fully adjustable shoulder sling is sewn under a leather side patch, which provides the facility to attach the area side pockets. 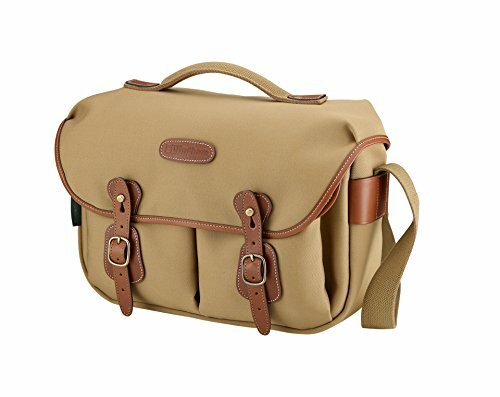 The Avea03 is the nicest looking fit as they are slimmer and match the side profile of the Hadley Pro. However, the avea05's will also fit if you need extra room and are less concerned with aesthetics. 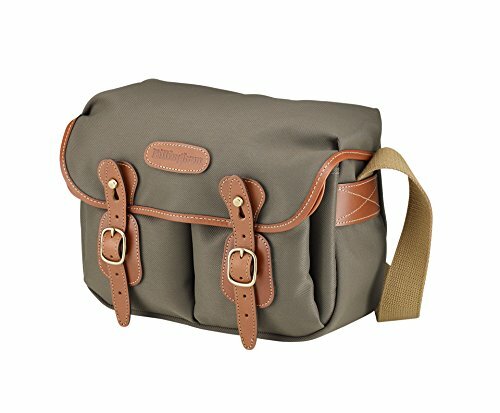 The two front pockets have generous bellows and separate flaps while the main flap has the Billingham quick release system and adjustable straps for increased loading. Fully adjustable camera insert includes two large and two small dividers. It is lined with Velcro tabs allowing the dividers to securely attach in any position. In addition, the one piece main flap extends from the front of the bag, reducing the number of seams and enhancing the bag's weather resistance. 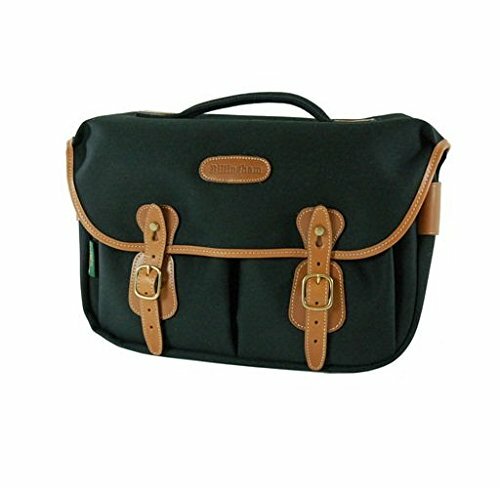 Based on the ever popular Hadley Original, the Hadley Pro is a mirror with added features. A carrying handle is integrated with a stiffener into the top flap. The weight of your gear is not carried through canvas holes that could wear out, rather they are attached to a fiberglass stiffener and weight supported through that. A waterproof zippered back pocket is very useful for tickets, magazines, manuals or any other flat document. The facility to add extra capacity with the AVEA pouches rounds off the bag nicely. It has a fully removable insert and features adjustable Quick Release strap into brass buckles, bellowed front pockets with press-stud fastenings and a double darted main flap which covers the mouth of the bag when closed protecting it from rain and weather elements. The fully adjustable shoulder sling is sewn under a leather side patch, which provides the facility to attach the AVEA side pockets. The AVEA03 is the nicest looking fit as they are slimmer and match the side profile of the Hadley Pro. However, the AVEA05's will also fit if you need extra room and are less concerned with aesthetics. 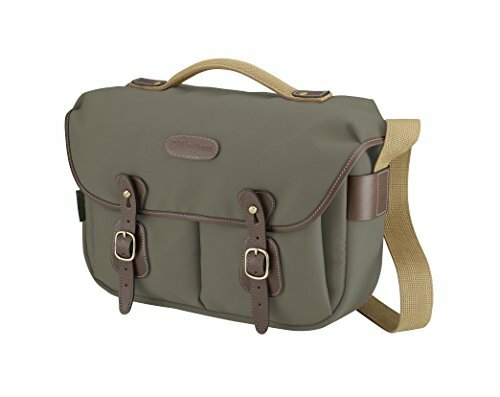 The Sage fibrenyte with chocolate Leather trim Hadley Pro shoulder bag from billingham holds a DSLR with an attached lens, A lens such as a 70-200mm f/2. 8, and a flash between padded, touch-fastened dividers within a removable camera insert. For accessories, The bag features dual expandable slip pockets at the front, and a rear zippered pocket at the back. The top front of the bag features billingham's classic rain flap, which is secured by front hand-finished Leather straps with brass detail. You can carry the bag using the adjustable shoulder strap with a comfort pad, or by using the top grip handle. 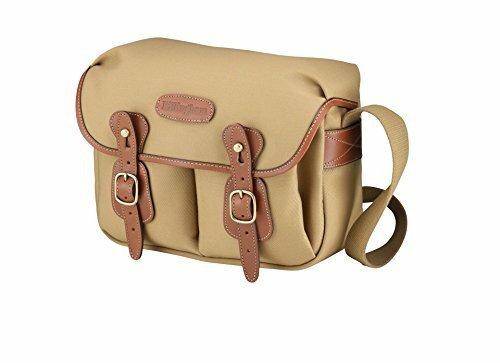 This camera bag is a favorite all over the world with serious photographers, the 335 has undergone a substantial re-design. The main compartment now has four extra "full-depth" pockets. The single, top opening was retained, but has now been re-profiled, so that it's possible for the zip panels to lie out of the way behind the inside pockets, to form the Billingham TukTop. In use the zipper can remain open and equipment kept out of sight and protected with the main flap. The simple straight zipper path allows a long, trouble-free life. The adjustable Delta shoulder sling comes complete with a leather and neoprene SP15 shoulder pad for a comfortable "hands free" carry. An 8-15 and 9-18 Superflex are included. 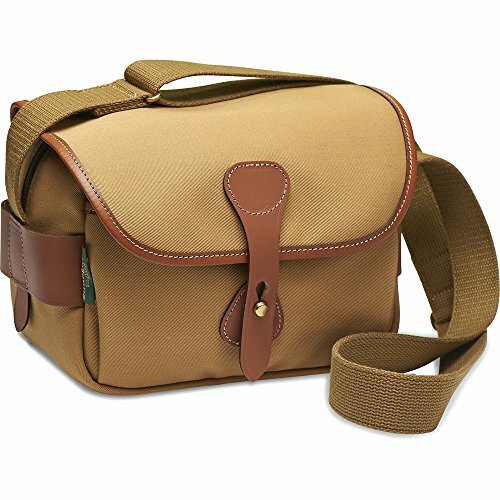 Store and protect your compact or mirrorless camera system in this khaki and tan S2 Shoulder Bag fromBillingham. This shoulder bag features one main compartment with two removable touch fastening padded dividers to organize and keep your gear securely in place. A removable fabric covered foam base ensures that even the bottom of your bag offers an extra level of protection against accidental bumps in transit. A front full-length dump pocket is perfect for your phone, a spare battery, and other essentials you prefer to have quicker access to. A discrete rear exterior zippered pocket provides a secure spot for your passport or extra cash while traveling. Comfortably carry your gear by way of the adjustable shoulder strap and dont fret over unknown or inclement weather predictions as the S2 Shoulder Bag features a triple layer waterproof fabric keeping your contents dry. 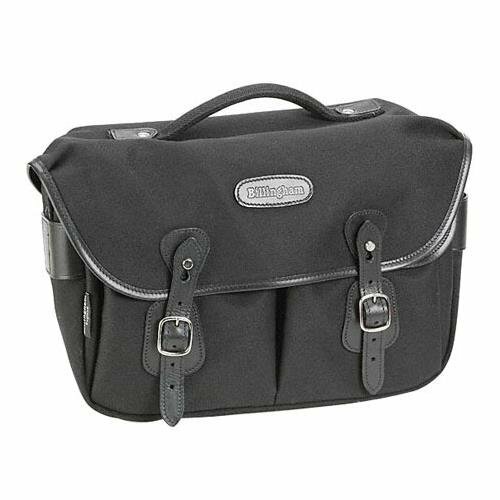 The Billingham Hadley shoulder bag small in Black with black leather trim includes a photo insert, which can be removed to allow the bag to double as a soft briefcase. Constructed of fibernyte waterproof canvas with high-density closed-cell foam throughout, it has a thin profile and is compressible to let the weight always stay close to your torso. 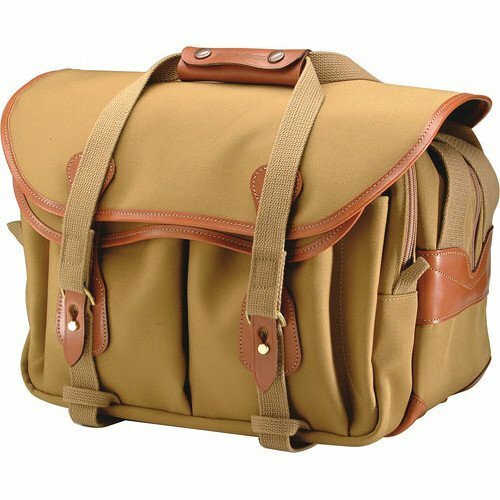 There are two gusseted front pockets that expand and close with quick-acting press stud the interior is divided, and you can rearrange it as needed or remove the padding to make the Hadley a conventional bag. Shopping Results for "Billingham Bags"